The Ribboned Cheetah Personalized Coasters features your guests of honors initial on a white background with a cheetah print background. The custom striped coasters measures 3 1/2 inches square and are made from pulp board. 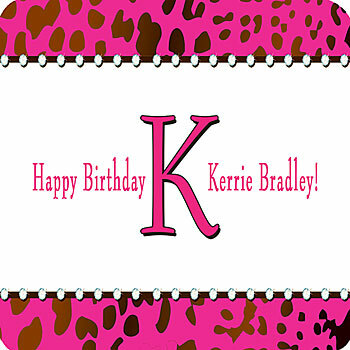 The Ribboned Cheetah Personalized Coaster are a great way to keep your party tables dry or a terrific keepsake.